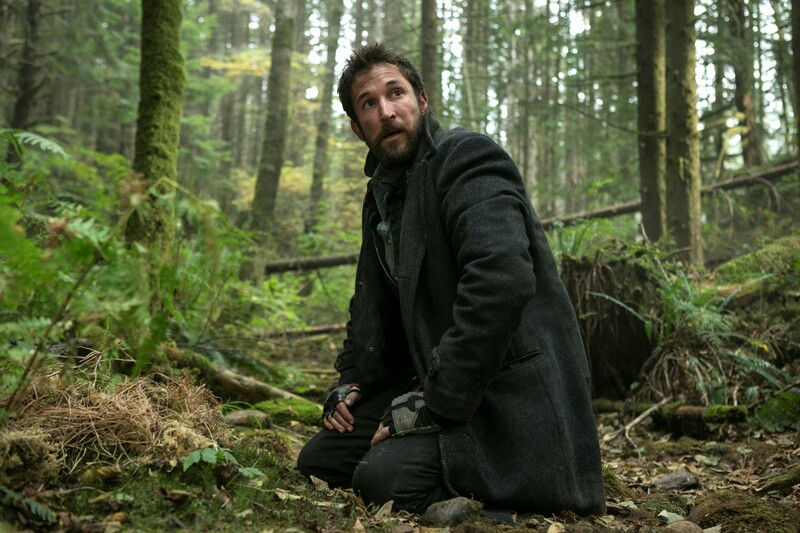 Plot: Tom Mason (Noah Wyle) and John Pope (Colin Cunningham) have crash landed in the woods and are split up from President Hathaway (Stephen Collins) and Cochise (Doug Jones). Now Tom and Pope must find a way back to Charleston while the Espheni are hunting them down. 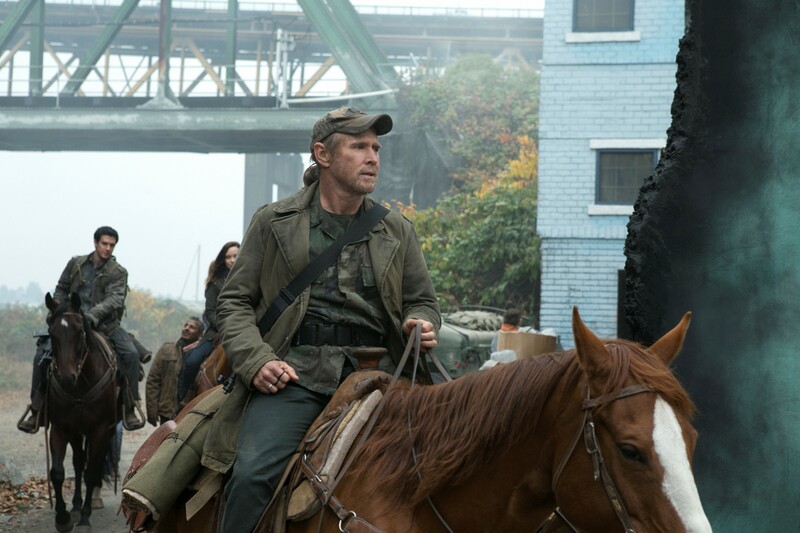 Meanwhile, Anne Glass (Moon Bloodgood) and Alexis are missing and Dan Weaver (Will Patton) leads a search party to find them. Vice President Marina Perlata (Gloria Reuben) also uses Tom’s absence to do some investigations of her own, with the help of Dr. Roger Kadar (Robert Sean Leonard). 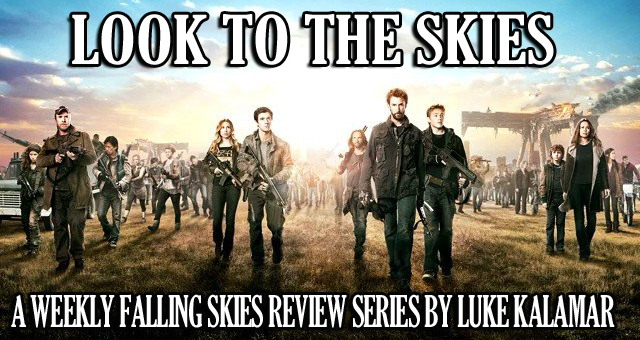 Falling Skies ended last week with a pretty exciting cliffhanger. The Espheni knew where Tom and the President were meeting for the first time, and they knew exactly what to do to cripple the humans. Both Tom and President Hathaway’s planes crash landed in a forest and their fates were unknown once the “To Be Continued…” came on the screen. As if that’s not enough, Anne attempted to run away but Evil Hal (Drew Roy) and some Skitters stopped her. Obviously they wouldn’t let Anne simply run away with an alien hybrid baby, so her fate was totally up in the air as well. This week’s episode “Search and Recovery” picks right off where “At All Costs” left off and we set down the path of resolving these separate events. With the perfect set up from a really great episode, “Search and Recovery” had the potential to be something truly exciting. Unfortunately, it misses its mark as one plot went nowhere and the other was filled with uncharacteristic behavior, despite some spectacular character development. The main story this week was rightfully the survival of Pope and Tom following their plane crash. Not only are they now stranded in the middle of a forest while being hunted by an advanced alien race, but General Bressler (Matt Frewer) was also killed in the accident so now they’re a man down. This story really worked for a couple of reasons. One is that it allowed us to get a deeper look into who Pope really is. We learned that he had a family, why he went to jail, and why he seems to thrive as an outlaw. It was the most character development I’ve seen for him despite Pope being around since the beginning, and I’d rather have it late than not at all. These past few episodes have shown more growth for Pope than ever before which is amazing. His character has been so integral to the 2nd Mass. for so long and I’m glad he’s actually become a well-rounded, third dimensional person. The accident also allowed Pope and Tom to get out their pent up rage with each other and that was pretty nice to see. Granted, getting into a fist fight while aliens are hunting you is a horrible idea, but I guess it had to happen at some point. While we got some excellent insight into Pope as a character, we also saw an unusual side of Tom that really felt out of place. 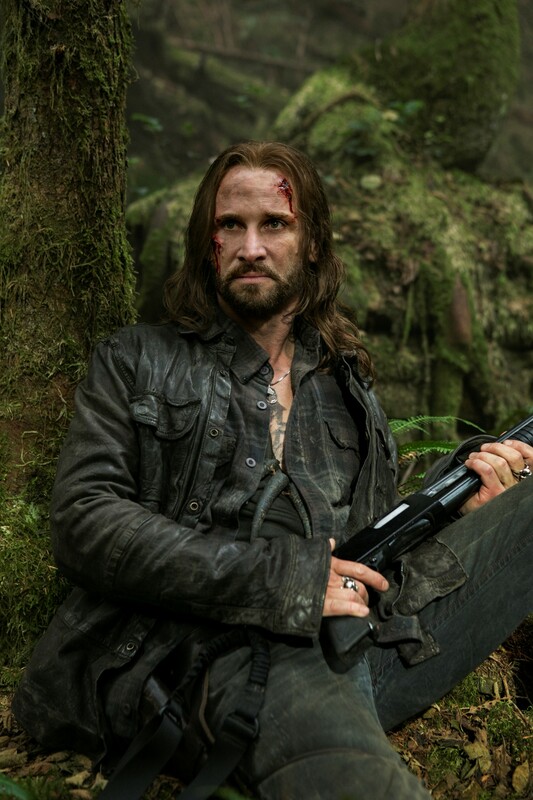 I’m not sure if it’s because Tom is under a lot of pressure being stuck with Pope in a forest filled with enemies, but for whatever reason he was strangely combative. Tom is usually as level-headed as they come so watching him get furious at Pope for dropping a snake on him was pretty bizarre. It gets even weirder when you think that Tom and Pope were just laughing and sharing stories by a fire a few hours before. Now Pope pulls one of his typical pranks in the morning, which Tom should expect by now, and then Tom decides it’s time to engage in fisticuffs. It was quite an overreaction to a little harmless prank if you ask me. Sure you could make the argument that this was Tom letting out all of his pent up rage against Pope, but surely he would’ve thought of a better time than when they’re lives are currently in danger from other sources. The last thing they need is a fight to the possible death against each other. Then we have the search team lead by Colonel Weaver to find where Anne and her creepy alien baby went. Just like the Tom and Pope plot of them returning to Charleston, the Anne search plot had its own hits and misses. What really worked during that little adventure was how we got some insight into the pasts of the Mason boys and their long deceased mother. The discovery of a dead mother rightfully caused Matt (Maxim Knight) to get nostalgic for life before the alien invasion, and his other brother Ben (Connor Jessup) was right there with him. Matt’s concern of dying alone and being buried by strangers is something I’m sure we’d all feel if we were in his place. So while I didn’t really care about the person they were burying (It was a completely unnamed random character after all), the impact it had on the search party was a real plus. What really didn’t work about the search for Anne and Alexis was the fact that in the end, they weren’t even found. Their whereabouts are still completely unknown as well. This is apparently because during this time Bloodgood actually was pregnant and had to take a maternity leave during the filming of Season 3. I didn’t know this before so I was actually expecting for them to find her, but now I can’t help but view that entire plot as filler. Character insight aside, the intention from the start was for Anne to not be found. Searching for her was obviously necessary but making it the focus of an entire episode seems like a pretty poor decision in retrospect. It’s really wasted time, especially since we didn’t get any plot progression for the show. Honestly, don’t expect Anne to be found anytime soon. To top it off, Hal was acting completely suspicious the entire time, to the point where I was confused if we were watching Evil Hal or Good Hal. Was this Good Hal being nervous that he had something to do with Anne’s disappearance? Or was this Evil Hal being nervous that he would be found out? It also didn’t help that he was thrust to the background during the entirety of this episode and really didn’t have many lines. It was quite a startling change from the focus he has received every single episode prior. Perlata’s investigation into what the Volm are building didn’t take up much of the episode, it was more of an afterthought honestly, but the potential ramifications of it are huge. Perlata has been a relatively quiet character so far this season and this episode really put her in the spot light. She’s a new character this season and we really don’t know much about her, but her actions in “Search and Recovery” put her at the top of my “Possible Spy List.” Her investigation into the Volm device without provocation, and even lying to Kadar about Tom asking her to do so, is the biggest red flag this show has ever given. I never once thought of her as the actual spy but now a lot of things about her really add up. Think about it: She’s a new character who has a relatively unknown past that, if she was a spy, would benefit greatly from quickly growing the ranks of Tom’s Government. It gives her a reason to kill Arthur Manchester (Terry O’Quinn), the former Vice President, in the premiere and explains why she is so interested in the Volm device outside of what Tom showed her. Obviously nothing is confirmed now, this whole spy thing will probably last all season, but brainwashed Hal seems like too obvious of a choice and now I’m officially making Perlata a real person of interest. I was a little disappointed as well in the complete lack of follow up into the plane crash that contained President Hathaway and Cochise. Two very important characters go missing and all we get is “We can’t get them on the radio?” How original. To make matters worse, I actually predicted this was going to happen last week. I didn’t write that in my review but after the two planes crashed in separate locations, my immediate reaction was “Looks like we won’t be seeing Cochise for a while.” Sure enough, I was absolutely right! Both Cochise and the President are still missing and that cliffhanger from the “To Be Continued…” remains unresolved. “Search and Recovery” had the perfect set up for something great following the cliffhanger at the end of “At All Costs,” but unfortunately a lot of it was squandered on a plot that went in a big circle and very strange actions on the part of Tom Mason. Pope got some amazing character development however, and the scenes with the younger Mason boys were very enjoyable. Hopefully next week we’ll get more of a conclusion to the remaining cliffhangers that weren’t even touched upon.